It’s been 9 years. Here we sit. A country divided. People so fast to point a finger. So quick to judge. So easy to blame. When you were sitting there…listening or watching the coverage of 09/11/01 did you feel divided that day? Did you feel the overwhelming sense to derogatorily bash your friend or loved one for their political beliefs? Did you hate your President? Did you pass judgment on someone based on their skin color or religion? What has happened to us? I read a blog post from a friend of mine: http://larissalytwyn.pnn.com/articles/show/61615-remembering-9-11 – she made me remember and perhaps realize what happened that day. I remember how united our country was after 9/11. Do you? Remember looking at someone and rushing your step to open the door for them? Do you remember saying “Thank you” to a stranger? Do you remember that vigil you attended with candles lit, asking for God’s Grace to get our beloved country through this horrible tragedy? Do you remember having a new found love for our firemen and police officers? Do you remember the silence of the airspace when our President ordered the entire U.S. is a No-Fly Zone? Now, I ask you to take those memories. Apply them to how you feel today. Are you reflecting that feeling of unity that we had on those days and weeks and months following 9/11, or are you letting the terrorists win? 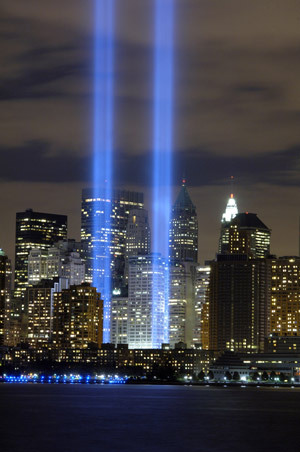 Those towers are not standing anymore…but there’s still a shadow…it’s up to you to shine your light…if you can find it.